WONGAN HILLS, E70/4882 and ELA70/5162, ~180 km north-east of Perth, base metals and gold project (Cullen 90% – Tregor Pty Ltd 10%). Cullen Resources Limited (Cullen or the Company) has received an interpretation of the preliminary data of its VTEMTM max survey at Wongan Hills from geophysical consultants “Newexco”. The results highlight multiple clusters and trends of interpreted bedrock conductors. In particular, five clusters of interpreted bedrock conductors, over strike lengths of ~0.4 to 1.5km which are coincident with significant CHI-3 geochemical index anomalies now define priority VHMS targets. None of the multiple geochemical anomalies with interpreted bedrock conductors has been the target of previous drill testing. The laterite geochemistry alone shows some similarities to that of the 50Mt Golden Grove VHMS system (as shown here by the CHI – 3 geochemical index). 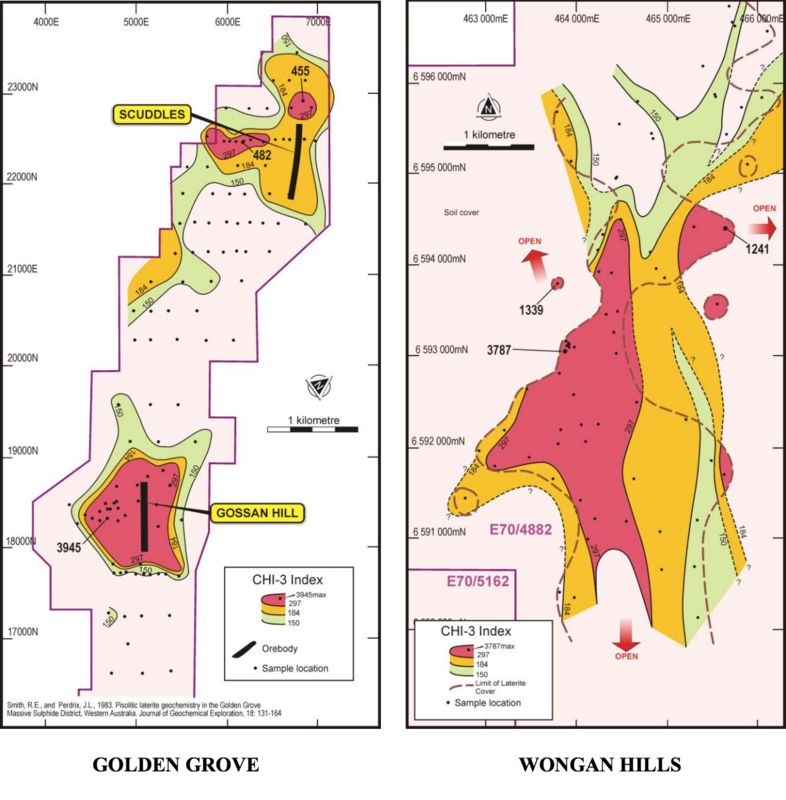 In Cullen’s opinion, Wongan Hills has several high priority targets for Volcanic-Hosted Massive Sulphides deposits (VHMS) of the Golden Grove – type. 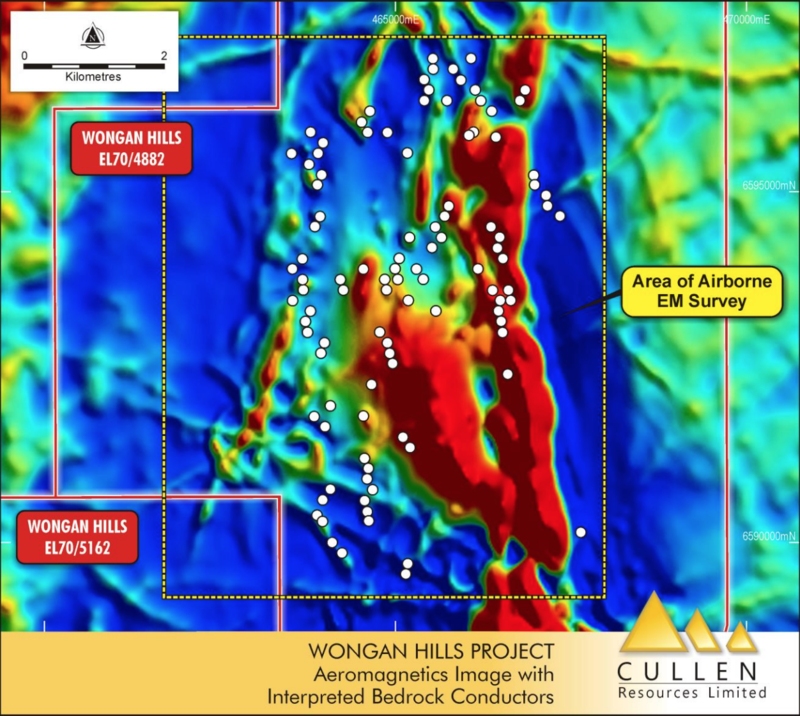 In June 2018, Cullen completed a helicopter-borne, Versatile Time – Domain Electromagnetic geophysical survey (VTEMTM Max) to advance its exploration at Wongan Hills. The survey was flown by UTS Geophysics Pty Ltd (266 line km on east-west lines spaced at 150m, with a sensor height of 30m) and was centred on the geochemical anomalies previously reported by Cullen. The objective of the survey is to test for bedrock conductive responses typical of massive sulphide deposits, particularly where they coincide with geochemical anomalies. The multiple interpreted bedrock conductors (Category 1 and Category 2 – the most significant in a three range classification) have been overlain on an air mag image (Fig.1) to show their relationship to stratigraphic trends, and/or other more discrete magnetic features, and importantly, on the geochemical anomalies (Fig. 3). This has enabled the prioritising of targets. Cullen’s laterite sample assays for E70/4882 (ASX: CUL – 5 July 2017; 24 April 2018; 3 May 2018) and compilation of historical geochemical data are summarised in Cullen’s ASX announcement of 18 July 2018. Using these data, Cullen has plotted the CHI – 3 geochemical index for Cullen’s laterite sample assays from Wongan Hills and compared it to a plot of the CHI – 3 geochemical index, as presented by Smith and Perdrix, 1983, for the Golden Grove VHMS deposits (Fig. 2), using the same contouring intervals. Cullen concludes that this comparison is in itself compelling evidence for the good prospectivity of the Wongan Hills project for VHMS deposits. This is reinforced by the overlay of interpreted bedrock conductors from Cullen’s VTEM survey on the Wongan Hills CHI – 3 geochemical index plot. There are five priority clusters of conductors which are embedded in the most anomalous CHI – 3 geochemical zones or their strike extension – four on the west and one on the east ranging from approximately 0.4 to 1.5km in strike length (Fig. 3). Some historical drilling has occurred in the general area of the eastern priority cluster – all other priority clusters are untested by any drilling. Other interpreted bedrock conductor trends are outside of the highest level of geochemical anomalies where defined by CHI – 3 = “297”. Some are broadly related to historical MMI geochemical anomalies (see ASX:CUL 18 July 2018), and at this stage there is limited geochemical and/or geological data on other trends, however, all are worthy of further investigation. Note, no bedrock VTEM data is available for the general area of the “Louise” geochemical anomaly in the western margin of the geophysical survey, due to the interference of conductive, near-surface, salt water. Fig. 2: Plot of CHI – 3 geochemical index values, laterite samples. Fig. 3: Prioritised clusters of interpreted bedrock conductors (1-6) plotted on CHI – 3 geochemical index values for laterite samples at Wongan Hills. None of the geochemical anomalies with interpreted bedrock conductors has been the target of any previous drilling. Modelling of the VTEM conductors by Newexco, together with a field review will further prioritise targets planned for ground EM surveys next Quarter. However, it is envisaged that several of the targets within E70/ 4882 warrant drilltesting and as most of these are located on freehold, arable farm land, a compensation agreement with the landowner(s) is required to permit further exploration. Cullen plans to negotiate the required agreements to permit access and/or drilling as soon as possible. Fig. 4. The approximate centre of the western CHI – 3 geochemical index anomaly is shown (yellow star) as is the approximate trend of the “Louise” geochemical anomaly (white arrow). Fig. 5. Geological interpretation of the Wongan Hills greenstone belt and Cullen’s tenure – map modified from Karajas, J, 2005 – see References. 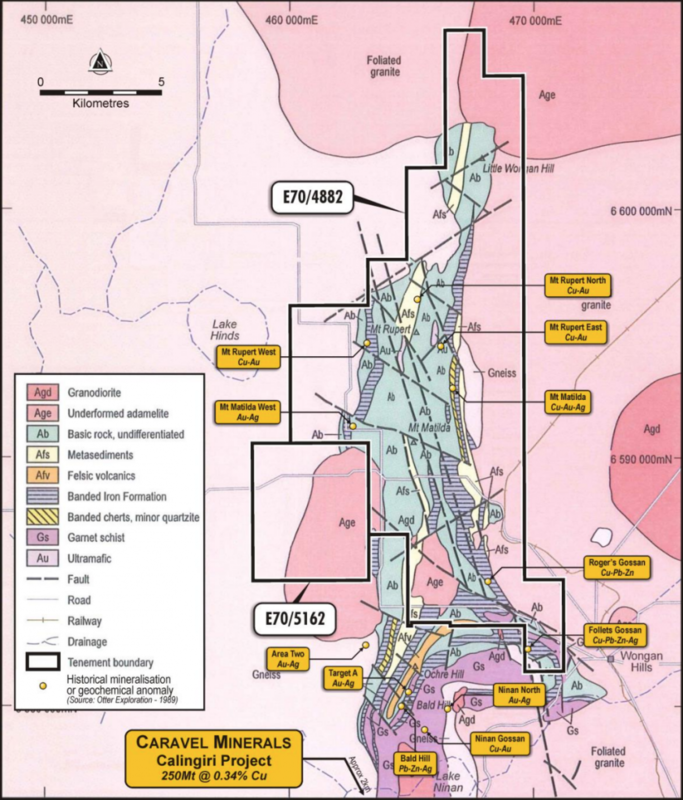 Note that Caravel Minerals’ Calingiri Project, lies to the south where 250Mt @ 0.34% Cu (Consolidated Indicated and Inferred Resource Estimate at 0.25% cut-off) has been delineated (www.caravelminerals.com.au). Cornelius, M., Robertson, I.D.M., Cornelius, A.J., and Morris, P.A., 2007. Laterite geochemical database for the western Yilgarn Craton, Western Australia: Western Australia Geological Survey, Record 2007/9, 44p. Smith, R.E., and Perdrix, J.L., 1983. Pisolitic laterite geochemistry in the Golden Grove, Massive Sulphide District, Western Australia. Journal of Geochemical Exploration, 18, 131-164. Karajas, J., 2005. Swancove Enterprises Pty Ltd. 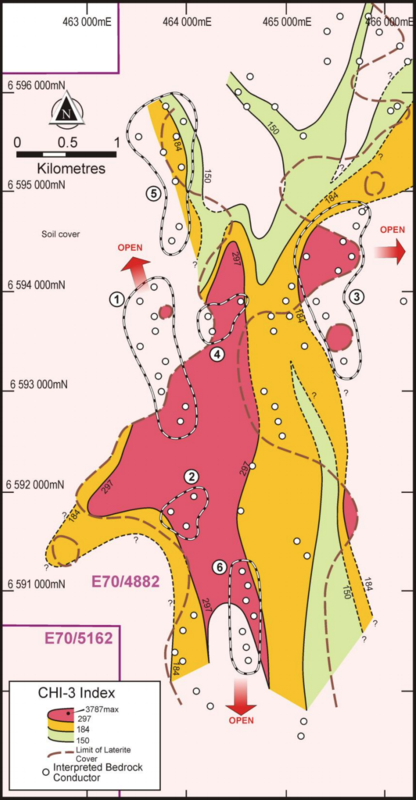 Combined annual mineral exploration report – E70-2437 and E/70-2443, Wongan Hills. For the Year to 14 January, 2005. WAMEX report A70056. Red River Resources Ltd, 2007. Partial Surrender Report E70/2437 & E70/2443 GSWA Ref No 12242, WAMEX report A74956. Smith, R.E., Birrell,R.D. , and Brigden,J.F., 1989: The implications to exploration of chalcophile corridors in the Archaean Yilgarn Block, Western Australia, as revealed by laterite geochemistry. In: Jenness et al. (Editors), Geochemical Exploration 1987, J Geochem . Explor., 312 : 169-184. Quarterly Report to June 30 2018 (18-7-2018). Quarterly Report to June 30 2017 (5-7-2017). Note : The 2012 JORC Code Table 1 data has previously been presented in each of the abovementioned ASX announcements by Cullen for its laterite sampling, and is included herein for the 102 sample assays forming part of this report’s summary compilation, together with the relevant 2012 JORC Code Table 1 data for the geophysical survey. The information in this report that relates to exploration activities is based on information compiled by Dr. Chris Ringrose, Managing Director, Cullen Resources Limited who is a Member of the Australasian Institute of Mining and Metallurgy. Dr. Ringrose is a full-time employee of Cullen Resources Limited. He has sufficient experience which is relevant to the style of mineralisation and types of deposits under consideration, and to the activity which has been undertaken, to qualify as a Competent Person as defined by the 2012 edition of the “Australasian Code for Reporting of Exploration Results, Mineral Resources and Ore Reserves”. Dr. Ringrose consents to the report being issued in the form and context in which it appears. Information in this report may also reflect past exploration results, and Cullen’s assessment of exploration completed by past explorers, which has not been updated to comply with the JORC 2012 Code. The Company confirms it is not aware of any new information or data which materially affects the information included in this announcement. This document may contain certain forward-looking statements which have not been based solely on historical facts but rather on Cullen’s expectations about future events and on a number of assumptions which are subject to significant risks, uncertainties and contingencies many of which are outside the control of Cullen and its directors, officers and advisers. Forward-looking statements include, but are not necessarily limited to, statements concerning Cullen’s planned exploration program, strategies and objectives of management, anticipated dates and expected costs or outputs. When used in this document, words such as “could”, “plan”, “estimate” “expect”, “intend”, “may”, “potential”, “should” and similar expressions are forward-looking statements. Due care and attention has been taken in the preparation of this document and although Cullen believes that its expectations reflected in any forward looking statements made in this document are reasonable, no assurance can be given that actual results will be consistent with these forwardlooking statements. This document should not be relied upon as providing any recommendation or forecast by Cullen or its directors, officers or advisers. To the fullest extent permitted by law, no liability, however arising, will be accepted by Cullen or its directors, officers or advisers, as a result of any reliance upon any forward looking statement contained in this document. 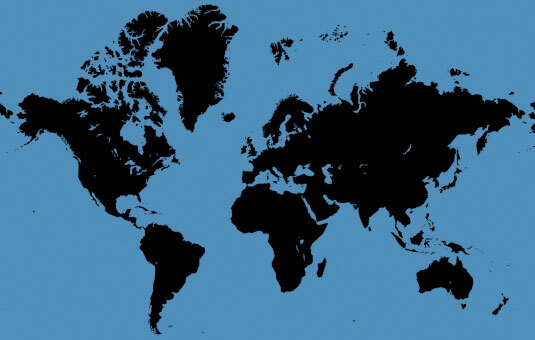 ABOUT CULLEN: Cullen is a Perth-based minerals explorer with a multi-commodity portfolio including projects managed through a number of JVs with key partners (Fortescue, Hannans Reward, and Matsa) and a number of projects in its own right. The Company’s strategy is to identify and build targets based on data compilation, field reconnaissance and early-stage exploration, and to pursue further testing of targets itself or farm-out opportunities to larger companies. Projects are sought for most commodities mainly in Australia but with selected consideration of overseas opportunities. REGISTERED OFFICE: Unit 4, 7 Hardy Street, South Perth WA 6151. CONTACT: Dr. Chris Ringrose, Managing Director. Sampling techniques Nature and quality of sampling (e.g. cut channels, random chips, or specific specialised industry standard measurement tools appropriate to the minerals under investigation, such as down hole gamma sondes, or XRF instruments, etc.). These examples should not be taken as limiting the broad meaning of sampling. A total of 102 reconnaissance samples of lateritic residuum i.e. ferruginous gravel and ferruginous duricrust. 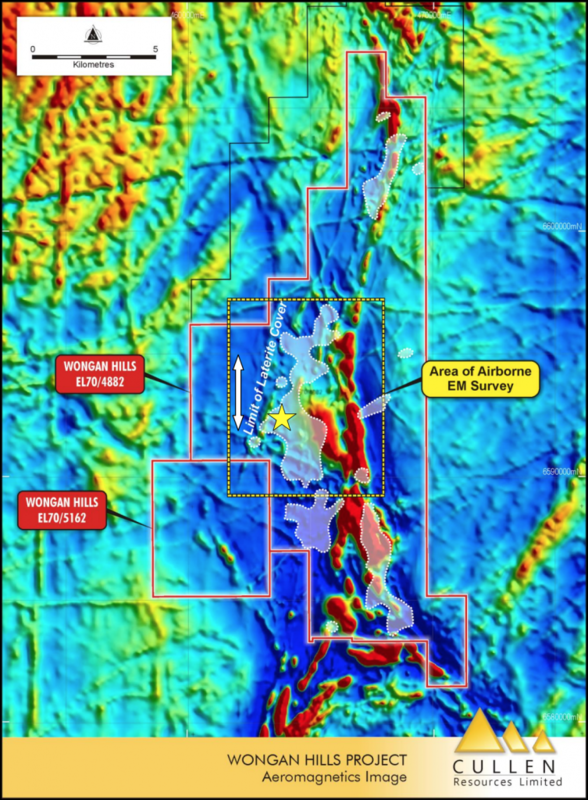 The VTEM survey was flown by UTS Geophysics Pty Ltd (266 line km on east-west lines spaced at 150m, with an EM sensor height of 30m) and was centred on the geochemical anomalies previously reported by Cullen. Aspects of the determination of mineralisation that are Material to the Public report Notes of colour, roundness, regolith setting and topography were made for each sample. In cases where ‘industry standard’ work has been done this would be relatively simple (e.g. ‘reverse circulation drilling was used to obtain 1m samples from which 3kg was pulverised to produce a 30g charge for fire assay’). In other cases more explanation may be required, such as where there is coarse gold that has inherent sampling problems. Unusual commodities or mineralisation types (eg submarine nodules) may warrant disclosure of detailed information. Samples were collected by hand from an area measuring approximately 5m x 5m. Where material is scarce, a larger area was sampled (10m x 10m) to obtain sufficient sample. Logging Whether core and chip samples have been geologically and geotechnically logged to a level of detail to support appropriate Mineral Resource estimation, mining studies and metallurgical studies. Laterite samples were examined and described for all features and the geology, topography and surface type noted. Photographs were taken of sub-crop, landform and setting where appropriate. Sub-sampling techniques and sample preparation If core, whether cut or sawn and whether quarter, half or all core taken. No subsampling or sieving is done in the field. The total sample is submitted to the laboratory and all sample preparation is done there. If non-core, whether riffles, tube sampled, rotary split, etc. and whether sampled wet or dry. All samples were collected dry by hand. For all sample types, quality and appropriateness of the sample preparation technique. All sample preparation is carried out at Bureau Veritas (BV) laboratory and is considered appropriate and to industry standard, to the best of our knowledge. Quality control procedures adopted for all sub-sampling stages to maximise representivity of samples. Laboratory international standards and duplicate splits were inserted by BV. Measures taken to ensure that the sampling is representative of the in situ material collected, including for instance results for field duplicate/second-half sampling. No field duplicates were collected. The nature, quality and appropriateness of the assaying and laboratory procedures used and whether the technique is considered partial or total. The assaying is industry standard in quality and total, and appropriate for the objectives of the sampling. Laboratory QA/QC involves the use of internal lab standards using certified reference material, blanks, splits and duplicates. Samples were submitted to Bureau Veritas Minerals (BVM) in Perth sorted, dried and whole sample crushed and pulverize to 85% passing – 75μm. A barren flush was pulverised between each sample. The samples were analysed by laser ablation ICPMS using XRF beads. Gold and some other elements were analysed following an Aqua Regia digest. For geophysical tools, spectrometers, handheld XRF instruments, etc., the parameters used in determining the analysis including instrument make and model, reading times, calibrations factors applied and their derivation, etc. Not applicable – no such instruments used in the field. Quality of assay data and laboratory tests Nature of quality control procedures adopted (e.g. standards, blanks, duplicates, external laboratory checks) and whether acceptable levels of accuracy (i.e. lack of bias) and precision have been established. No control procedures or external checks done. Laboratory QA/QC involves the use of internal lab standards using certified reference material, blanks, splits and duplicates. Samples dried, pulverized with 85% passing -75μm established. Location of data points Accuracy and quality of surveys used to locate drill holes (collar and downhole surveys), trenches, mine workings and other locations used in Mineral Resources estimation. Samples located using a handheld GPS. Quality and adequacy of topographic control. No topographic control. Whether sample compositing has been applied. No compositing applied. Orientation of data in relation to geological structure Whether the orientation of sampling achieves unbiased sampling of possible structures and the extent to which this is known, considering the deposit type. Sampling is at a very early stage of exploration. Sample security The measures taken to ensure sample security. All samples were collected, bagged and transported to the laboratory by Cullen staff and consultants. Audits or reviews The results of and audits or reviews of sampling techniques and data. No reviews or audits of techniques and data. Type, reference name/number, location and ownership including agreements or material issues with third parties such as joint ventures, partnerships, overriding royalties, native title interest, historical sites, wilderness or national park and environmental settings. The samples were taken on E70/4882 which is held in the name of Cullen Exploration Pty Ltd. – 90%; and Tregor Pty Ltd -10%. The security of the tenure held at the time of reporting along with any known impediments to obtaining a licence to operate in the area. Tenement is approved with a heritage agreement in place with Native Title Party. The tenement includes private land and a compensation agreement will be required to be signed with key landowners to allow progress to any drill testing. Exploration done by other parties Acknowledgement and appraisal of exploration by other parties. Previous work by others has included soil and laterite sampling and some drilling – as referenced in this report. Geology Deposit type, geological settings and style of mineralisation The sampling targets Archaean volcanic hosted massive sulphide base metal deposits and gold deposits. Data aggregation methods In reporting Exploration results, weighing averaging techniques, maximum and/or minimum grade truncations (e.g. cutting of high grades) and cut-off grades are usually material and should be stated. No averaging or aggregation techniques have been used. No top cuts and no metal equivalent values have been used in this report. The assumptions used for any reporting of metal equivalent values should be clearly stated. Not applicable – no metal equivalent values have been used in this report. Diagrams Appropriate maps and sections (with scales) and tabulations of intercepts should be included for any significant discovery being reported. These should include, but not be limited to a plan view of drill hole collar locations and appropriate sectional views. Not applicable – a general location figure depicting the geological setting of the laterite anomalies is appropriate and included. Balanced reporting Where comprehensive reporting of all Exploration Results is not practicable, representative reporting of both low and high grades and/or widths should be practiced to avoid misleading reporting of Exploration Results. All relevant pathfinder elements of the whole sample suite are reported. Other substantive exploration data Other exploration data, if meaningful and material, should be reported including (but not limited to): geological observations, geophysical survey results, geochemical survey results, bulk samples – size and method of treatment; metallurgical test results; bulk density, groundwater, geotechnical and rock characteristics; potential deleterious or containing substances. From ground examination there does not appear to have been any previous drilling or exploration in the area of the historic geochemical anomaly reported in the YLA and referenced in this report, or in the western half of the EL. Further work The nature and scale of planned further work (e.g. tests for lateral extensions or depth extensions or large-scale step-out drilling). Further programmes, including drilling, are anticipated and will be possible once the required land access agreements are in place and cropping is concluded this season. Diagrams clearly highlighting the areas of possible extensions, including the main geological interpretations and future drilling areas, providing this information is not commercially sensitive. Figures included showing location and geological setting of the geochemical results and sampling. No drilling used. Note 1: The CHI – 6 and CHI – 3 geochemical indices are calculated for positive values only. Negative ones (below detection) were substituted with a half or a third the detection limit. 2: All values used for the indices with the exception of Se are based on the laser ablation/MS analyses. Selenium and gold analyses are by Aqua Regia/ICPMS. All values in ppm except for gold in ppb. The use of geochemical indices was discussed in Smith, R.E., and Perdrix, J.L., 1983 as a guide to interpretation.